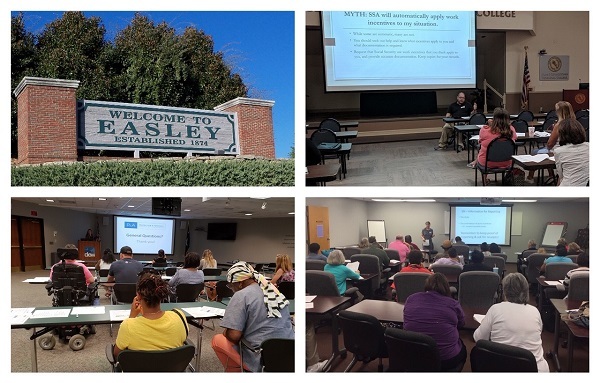 Easley Disability Benefits & Employment: Make it Work for You! Photos in a grid: the welcome to Easley sign, and the Myrtle Beach, Florence, and Columbia workshops. Are you interested in going to work or increasing your earnings? Do you have questions about how going to work might affect your Social Security benefits as someone with a disability? Would you like to get better connected to the agencies in your area that provide employment supports to people with disabilities? If so, this free workshop is for you! Come to learn more from experts on how working affects SSI and SSDI benefits and from agencies that help people meet their employment goals. Share the flyer to help us spread the word! If you need accommodations, please request them by October 10, 2018, by contacting Sandy Jordan at sjordan@able-sc.org or 800-681-7715/TTY: 864-235-8798. Logos for the organizations involved: SC Vocational Rehabilitation Department, Protection and Advocacy, SC Works, Able South Carolina, SC Assistive Technology Program, and SC Commission for the Blind. Below are logos for the WIPA program hosted by Walton Options for Independent Living and Hire Me SC’s funder, the Administration for Community Living at the US Department of Health and Human Services.